At the last meeting of the Stirling Smith Trustees, the loan of this painting for four months in 2018 to La Boverie, the new Museum of Fine Arts in Liege, Belgium, was approved. La Boverie, working with the Louvre will present an exhibition on the European Grand Tour, popular with artists and aristocrats in the 18th and 19th centuries. 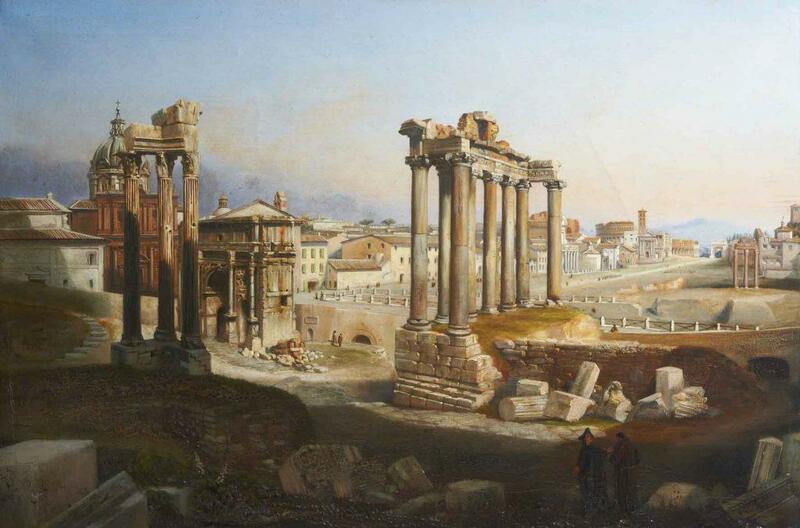 This view of the Forum in Rome was painted by Macpherson (1814 – 1872) in the early 1840s, when he was trying to establish himself as an artist. This work will be hung with similar views by Schilbach (from the Thorvaldsen Museum, Denmark), Sarrazin de Belmont (from the museum in Tours, France), Eckersberg (National Gallery, London) and Roberts (Birmingham Museum of Art, USA). The Smith’s painting will be in international company and although the view is familiar to all visitors to Rome, the work is exceptionally rare. Macpherson failed as an artist, and therefore moved into the new art of photography where he had great success. Few paintings by Macpherson survive. La Boverie will be borrowing one of his photographs of the same view from the John Paul Getty Museum in Los Angeles. The Smith’s painting holds a key message in the global story of the competition between painting and photography in the mid 19th century. Do you know if the piece will be shown in Stockholm at some point in 2018?